ENR New England recently recognized the winners of its 2015 Best Projects competition - J.H. Maxymillian, Inc.
ENR New England recently recognized the winners of its 2015 Best Projects competition, honoring the top projects in Connecticut, Maine, Massachusetts, New Hampshire, Rhode Island and Vermont. 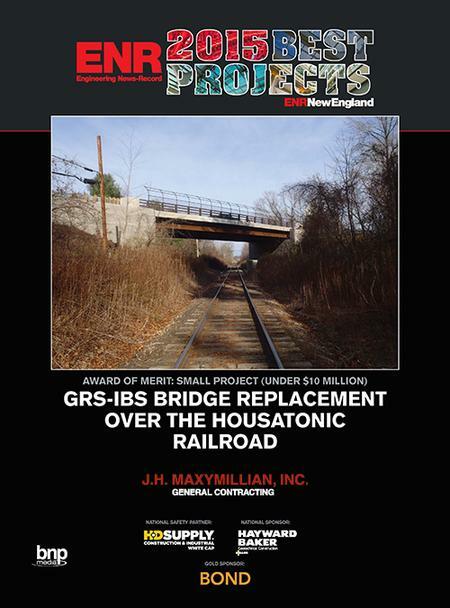 We are proud to be the recipient of an Award of Merit in the category for Small Projects (under $10 million) for our GRS-IBS Bridge Replacement over the Housatonic RR!